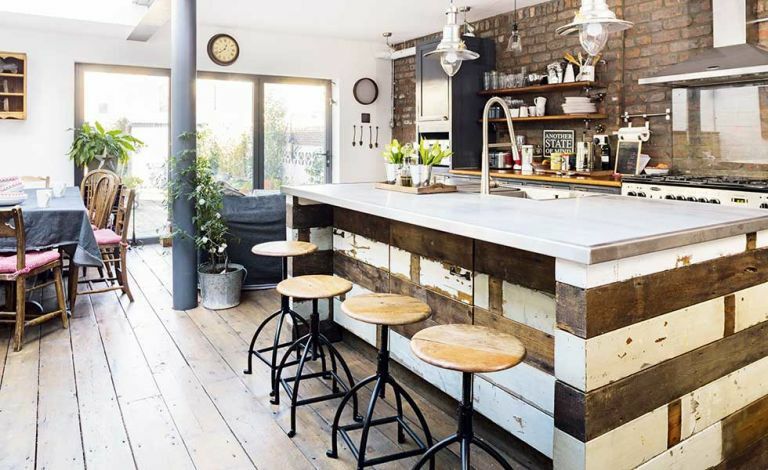 Pippa Mundy took a somewhat unconventional approach to transforming her Victorian Cardiff house into a stunning industrial-style home. She had an overall vision for her home, but believed in respecting the essence of the building. By allowing it to reveal itself as they stripped it back to its bare bones, the direction of the project took shape. Find out how she did it, then browse more of our real home transformations. Read our guide on renovating a house, too, for more guidance. While Pippa’s intuition proved correct, it was her ability to remain calm in a crisis that was truly invaluable. When the second-floor ceiling fell down while the wallpaper was being stripped off, she saw it as a chance to create a striking pitched roof, instead. When it was discovered that the foundations for her extension required costly adjustments, Pippa simply amended the plans to include a supporting pier structure. ‘Ultimately, problems are just something to work with and can lead to unimagined possibilities,’ she says. House renovation costs: how much does it cost to renovate a house?